Internationally acclaimed ultra endurance runners Janette Murray-Wakelin and Alan Murray ran together around Australia throughout the year 2013, a distance of 15,782km, running 366 marathons (43km) each in 366 days, setting a World Record as the only couple over the age of 60 to run 366 consecutive marathons, fuelled entirely on raw vegan food and wearing barefoot shoes. Janette and Alan have been actively following a raw vegan conscious lifestyle for over 15 years and Janette is the author of the best-selling book “Raw Can Cure Cancer’ based on her journey with cancer and her second book, ‘Running Out of Time’, is based on their Run around Australia. Starting the Premiere Tour of Australia, the film based on their Run Around Australia, entitled ‘RAW -the Documentary’ premieres at the Transitions Film Festival in Melbourne, 17 February 2017. 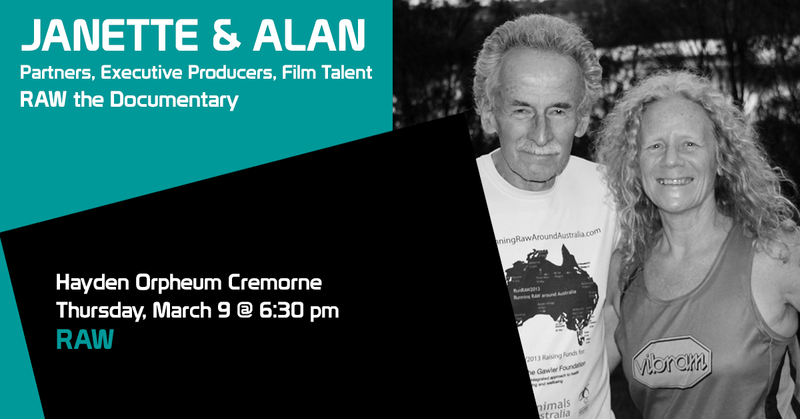 Janette and Alan are inspirational and motivational speakers who live in Queensland, Australia.